Dear Readers, for 40 previous issues – from October 2004 to February 2008 - we brought you a spiritual feast in the form of the "Gita for Children" in a serialized form. Prior to that, we had started our first series entitled "Shirdi Sai – Parthi Sai" which is continuing till date. The "Gita for Children" series was taken from the book "Krishna - Arjuna Dialogue" authored by Prof. Venkataraman. As we concluded the final segment of this book in February 2008 issue, from March 2008, we started a new series on "Avatars" or Divine Incarnations. The articles in this series are actually adaptations of talks delivered recently on Radio Sai by Prof. G. Venkataraman, and are based on the book "Message of the Lord" authored by him a few years earlier. We hope H2H readers will relish the spiritual insights this series offers. The last episode concluded with a description of a dice game in which the Pandavas lost everything and Draupadi was about to be humiliated publicly when Krishna’s grace saved her. Following that, on Gandhari’s advice, King Dhritarashtra gave back to the Pandavas the kingdom they had lost through gambling. But that did not mean that the Pandavas troubles were over. On the contrary, the dice game that ended disastrously was just the beginning. What happened next? Read on. This scene in the Mahabharatha (the epic story of the Pandavas and the Kauravas), is deep with significance. It shows how even the clever and the righteous can, at critical times, lose their discrimination (as did Yudhishtra). It shows that even the learned and the wise sometimes turn a blind eye to grave misdeeds in society, shirking their duty to protest and give expression to their conscience (as did Bhishma, Drona and Kripa during the dice game that was described last time). Above all, it shows how when everything else seems lost, there is still the Lord, the last resort; and He never fails a loyal devotee. Swami often describes the rescue of Draupadi by Krishna and then refers to a later personal meeting between the two of them when Draupadi asks, "O Krishna, what took You so long to come to my rescue?" To that Krishna replies, "Draupadi, you hailed me as Dwarakavasi [the One who lives in Dwaraka] and so I had to first rush to Dwaraka to make your words true. Then you addressed Me as Mathuravasi [the One who lives in Mathura] which made me rush to Mathura. With all this running around, I couldn't come quickly to your aid. Finally, you hailed Me as Hridayavasi [the One who dwells in the Hridaya or the heart]. At that point, I could rush immediately because no long distance travel was involved!" The point being made is simply that God is not here or there; He is present right in our hearts 24/7, and that really is where we must look for Him. "Dice game again? Which fool would agree to that?" Dhritarashtra asked, to which Duryodhana replied, "Father you seem to forget that no matter what the circumstances, a person of royal blood can never refuse an invitation to a game of dice. That is his code of conduct and you know Yudhishtra is a stickler for observing the code." The weakling and the doting father that he was, Dhritarashtra yielded to his son's perverted arguments and Vidura was once again sent to invite the Pandavas. "Once bitten, twice shy", says the proverb. No matter what the code of etiquette, the Pandavas could, with justification, have refused the invitation for a second round but strangely, each one reconciled to it for a different reason. 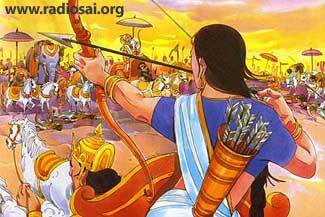 Bhima, for example, felt that this time by winning they could wipe out the ignominy of the former occasion. And so it was that the second round of the dice game commenced, hardly before the wounds inflicted in the first had healed. This time, Sakuni changed the bets; the losing party would go away in exile to the forest for a period of twelve years, followed by one year of incognito existence. If during that one year period their identity is discovered, the whole penalty would have to be gone through again i.e., another twelve years in the forest followed by one year of incognito life. The deal was agreed to and the game commenced. 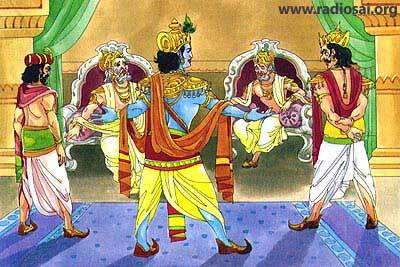 Once again Sakuni cheated and in no time at all, Yudhishtra won for the Pandavas the thirteen-year hardship. Soon after the Pandavas left for the forest, Vidura remonstrated with Dhritarashtra for being nose-led by his vile sons. In his heart Dhritarashtra knew that what Vidura said was correct but unable to stomach the truth, he ordered Vidura out, and Vidura departed gladly. But soon better sense prevailed on the blind king, for without Vidura, he was doubly blind. A messenger was sent to fetch Vidura, who, by this time, had joined the Pandavas; thus within a jiffy, Vidura was back to his thankless job of advising a king who was not only blind but deaf as well (to his sane advice, that is). Meanwhile Krishna, who was busy in Dwaraka grappling with His own problems heard about the double debacle suffered by the Pandavas and rushed to the forest to commiserate with them. While many advocated immediate war, Yudhishtra was cool, firmly committed to the assurance given earlier that the loser would serve a thirteen-year hardship. Draupadi who was still smarting under the humiliation she had suffered, asked Krishna with anguish: "O Krishna, my tormentors have gone scot-free while the great Pandava heroes are here in the forest. Is their might and prowess doomed to hibernation in this jungle? Why don't You speak out?" Visibly moved, Krishna replied, "My dear sister, listen to Me. Those who tormented you cannot go scot-free; on the contrary, they are doomed to miserable death in a bloody battle field. I can see it coming but you cannot. All I ask for from you is patience - that is all." And so with much patience and fortitude, the Pandavas went through the twelve long years of hardship and difficulties, and of course, with it numerous experiences as well. Indraprastha, the kingdom they once ruled, now came under the control of the Kauravas and it was not clear if the Kauravas would return it at the end of the exile period. Therefore, in preparation for a possible war, Arjuna, on the advice of elders, withdrew for a while to the Himalayas to meditate on Siva, offer intense penance and seek the boon of divine weapons. 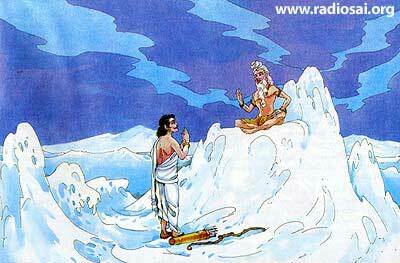 Pleased with Arjuna's devotion, Siva in due course blessed him with an immensely powerful missile known as Pasupata. 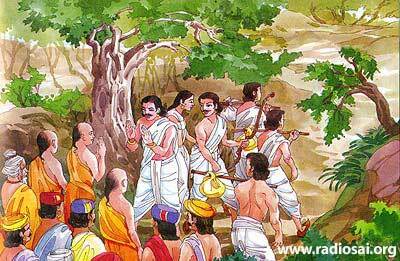 One day during the exile period, Duryodhana and Karna got the idea of going to the forest Dvaitavana where the Pandavas were spending time so that they could personally see the suffering of the exiled ones, and gloat over it. But when the Kauravas went to Dvaitavana with their army and royal retinue, they faced obstruction from a Gandharva prince and a fight ensued. Curiously, in spite of their great strength, the Kauravas were worsted in the fight and were taken captive. 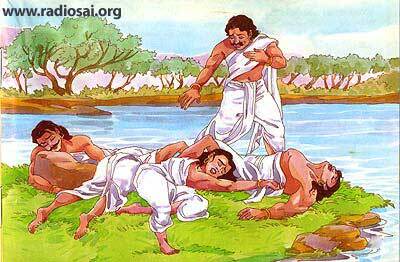 Instead of seeing the Pandavas in trouble, Duryodhana was himself in difficulties, having been bound hand and foot! Some of the Kauravas who escaped capture ran to Yudhishtra to give him the news. And what did Yudhishtra do? He ordered Bhima and Arjuna to attack the Gandharvas and secure the release of Duryodhana! Bhima was aghast, and at first, flatly refused but Yudhishtra told him in compelling terms, "Bhima, I know how you feel but Kauravas are our cousins. One should not rejoice at the suffering of even one's worst enemy; that being the case, how can you exult on the suffering of your own cousin? That is not in conformity with Dharma." Though not fully convinced, Bhima and Arjuna yielded to their elder brother because when it came to adherence to Dharma there was no greater stickler! In no time at all, the Gandharvas were vanquished and the release of Duryodhana was secured. Ashamed and thoroughly humiliated, the Kauravas returned to Hastinapura, their mission having completely backfired. Yudhishtra's extraordinary commitment to Dharma is exemplified by an incident which took place during the exile. One day, while wandering in the forest, Yudhishtra became very thirsty and asked Nakula to fetch some water. Nakula searched and soon found a pool. Feeling thirsty himself, he thought he would first take a sip before taking water for his elder brother. 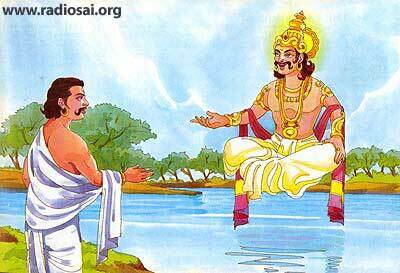 Just then he heard a voice which said: "I am the Yaksha who is the Lord of this pool. Before you drink my water, you must first answer my questions; if you violate my stipulation, you would fall dead." Nakula was so thirsty that he did not pay attention to the warning; he drank some water and promptly fell dead. As Nakula did not return for quite a while, Yudhishtra sent Sahadeva to investigate and also get some water. It was the same story again; Sahadeva too violated the warning and fell dead. After this it was the turn of Bhima and Arjuna, and finally, thoroughly perplexed, Yudhishtra set out to investigate. He too reached the fatal pool and saw the corpses of his four brothers. Even as he was wondering as to what had happened, the voice sounded again with the usual caveat. Yudhishtra realised that all his brothers must have ignored the warning and learning from that experience, decided to answer the questions posed. The questions from the so-called Lord of the pool followed in rapid fire. "What makes the Sun to shine every day?" Yudhishtra replied, "The power of Brahman." "What rescues man in danger?" "By what study does a man become wise?" "Wisdom does not come from study but by association with the wise and the great." "What is that by abandoning which man becomes the beloved of all?" "What is that which when lost leads to joy?" "And, what is the greatest wonder in the world?" "People believing they would live for ever, even though they see people dying everyday!" Pleased, the voice said, "O Wise One, you may have one of your brothers back alive; I leave the choice to you. Which among the four do you want alive?" 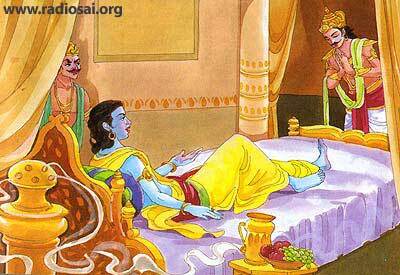 Without a moment's hesitation, Yudhishtra replied, "I want Nakula; please restore him to life." The voice said, "This I shall gladly do but would you first tell me why you chose Nakula and not say Bhima or Arjuna?" To that Yudhishtra answered, "O Lord of the pool, my father had two wives - Kunti and Madri. I am the eldest son of Kunti, and Nakula is the eldest son of Madri. It was in the interest of natural justice that I asked for the restoration of Nakula, for in that manner both my mothers would have one surviving son each." At this stage, the voice assumed a form and revealed itself; it was none other than Yama or Dharmaraja, the father of Yudhishtra. He said, "Son, I am mighty pleased with you and as a token of my happiness, I shall restore all your brothers to life. Only a few days remain for the completion of your twelve year exile. It will pass off smoothly and the thirteenth year also will pass by. You are a shining beacon of Dharma and one day you will reign as king supreme." Finally came the thirteenth year which had to be spent incognito. For this purpose, assuming appropriate disguises, the Pandavas accompanied by Draupadi went to the court of King Virata and found suitable employment there. 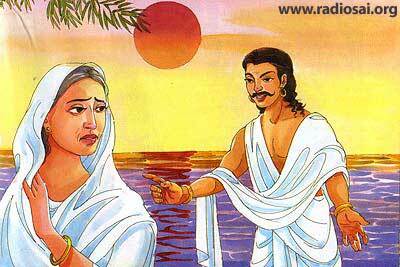 One day towards the end of the incognito period Draupadi who was being continually harassed by a man called Kichaka complained to Bhima about her problem. Suitably enticing Kichaka to a secluded spot Bhima killed him after a fierce fight. This was no ordinary feat since Kichaka was a huge ruffian. Word about this reached the Kauravas and they strongly suspected that Kichaka's death must have occurred at the hands of Bhima. Wanting to expose the disguise of the Pandavas and thus exile them for another thirteen years, they rushed to the kingdom of Virata and attacked it. A battle ensued in which Arjuna, though in disguise as a female, participated and the Kauravas were defeated. Duryodhana protested that he had seen through the disguise of the Pandavas, and that therefore they had to repeat their exile as per the original conditions. The Pandavas refused, insisting that by the time Duryodhana woke up, the exile period was actually over, a fact confirmed by Bhishma. 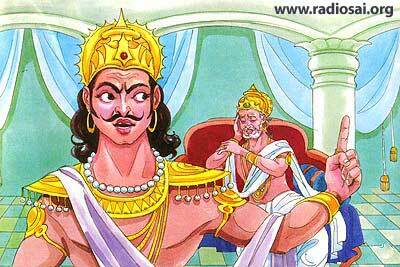 Duryodhana refused to accept the contention, and there was tension in the air. The big question in everyone's mind was: What would happen now? Though the Pandavas knew well the psychology of their Kaurava cousins, still the ever-peaceful Yudhishtra decided to try the olive branch by sending an emissary to the court of Dhritarashtra, seeking a peaceful return of Indraprastha which had been annexed by the Kauravas during the exile period. As was widely forecast, the emissary returned with empty hands. The war clouds now began to gather, and both camps began to line up allies in the event of an armed conflict. As a part of this exercise, both Duryodhana and Arjuna went to Dwaraka to seek Krishna's help. Fully aware that the two were coming, Krishna staged a little drama. Even as the two were arriving, He lay in His bed, pretending to be fast asleep. By the side of His head, there was placed a chair. Both Duryodhana and Arjuna being well known to Krishna had the right of free entry into Krishna's palace, right up to the bedroom. A glimpse of what was to come..
Duryodhana arrived first, saw Krishna sleeping, parked himself in the empty chair, and waited for Krishna to wake up. Arjuna entered shortly thereafter, and he too saw that Krishna was sleeping. 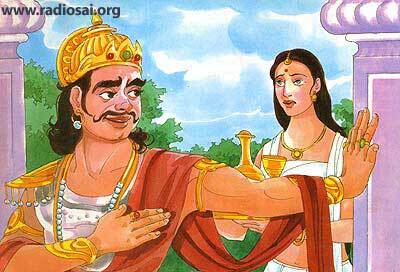 He was annoyed that Duryodhana had come ahead of him but there was nothing he could do about it. He decided that he too would wait for Krishna to wake up, and he stood standing near Krishna's feet, his hands joined in reverence. Feeling that it was time to get on with the play, Krishna now pretended to wake up and since Arjuna was near His feet, chose to see him first and asked, "Hello Arjuna, nice to see you. When did you come?" Annoyed that Arjuna received the first attention, Duryodhana said, "Krishna, I too am here; in fact, I came first." With a smile on His face, Krishna said, "That may be true, but since I saw Arjuna first I am obliged to attend to him first. By the way, I know why both of you have come here. You are both preparing for war. As for Me, I am a man of peace. If you want Me, let Me make it clear that I would not lift any weapon nor fight. But if you wish, you can have My army and I don't mind if they fight. Now Arjuna, what will be your choice?" Without a moment's hesitation, Arjuna said, "Krishna, I want You, You and You alone; it does not matter if You will not take up arms." This was sweet music to the ears of Duryodhana who wanted Krishna's army rather than Krishna himself. In this manner, Krishna pleased both his visitors and each got what he deserved! And that, incidentally, was how Krishna ended up as Arjuna's charioteer in the great Kurukshetra war. This scene too is full of inner significance for it portrays the two choices man has to seek either worldly gifts from the Lord Almighty or to seek His Divine Grace i.e., Preyas or Sreyas. Almost invariably, the preference of man is for Preyas, rather than Sreyas even though it is well established that Preyas leads only to misery. Right from the time of Duryodhana, that lesson has still to be learnt! As the war clouds got stronger, Dhritarashtra began to get scared. He therefore sent his close associate Sanjaya as his envoy to plead with the Pandavas to let bygones be bygones, live in peace bearing no animosity to the Kauravas and, incidentally also forget their claims to Indraparastha! "O King, the Pandavas are peace-loving people. They have fully completed their obligations following their defeat in the game of dice thirteen years ago. All they now ask for is their old kingdom. Please be wise enough to return their territory." Dhritarashtra was inclined to agree to Krishna's request but the ever-angry Duryodhana intervened and shouted, "No Indraprashtha, no town, no village; not even five pinheads of land shall we give the Pandavas." Krishna returned empty handed (as He knew He would! ); and the die was firmly cast - it now would be war. Events moved swiftly, both sides now striving their best to line up as many supporters as possible. In accordance with the injunctions of war, the rules of combat, the place of fighting, the hours of fighting, etc., were all meticulously laid down and both sides swore total commitment to the observance of the rules. Thus it was that Kurukshetra was selected as the venue for the battle, and each day the fighting was to conclude at sunset. 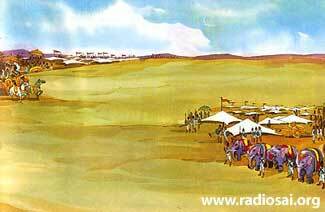 On the opening day, just before the fighting actually commenced, Yudhishtra got down from his chariot and with folded hands walked towards the Kaurava ranks. Everyone was flabbergasted. Was Yudhishtra throwing in the towel and surrendering? No such thing! All that was happening was that Yudhishtra was going to pay his respects to elders like Bhishma, Kripa and Drona whom he shortly would have to face as adversaries. Was this all a big put on? No, on the contrary Yudhishtra took his duties to elders quite seriously. Thus when he approached Bhishma he reverentially bowed to him and said, "Grandsire, I offer my humble salutations to you and seek your pardon for daring to fight against you. As you well know, all this is ordained by fate and neither of us have any control over it. I seek your blessings and also the permission to begin the fight. And, please also advise us how we may conquer you!" That then is the sample of the etiquette of those times. A few remarks about how Bhishma and a few others found themselves fighting on the side of the Kauravas. Bhishma, for example, never approved of the actions of either Dhritarashtra or Duryodhana, but having all along enjoyed in some sense their patronage, was committed to fight on the side of the Kauravas. Karna was another example. He had many wonderful qualities, apart from his martial skills. As a generous donor who gave freely to charities, Karna was unequalled, and many are the stories of extreme sacrifices made by him. In his heart of hearts, he knew that Duryodhana was pure evil and that all his actions were wrong. Yet, that same Duryodhana had, when others sneered at him as the lowly son of a lowly charioteer, conferred status by making him without as much as a second thought, the King of Anga. So loyalty compelled him to serve the cause of Duryodhana. On the eve of the battle, Kunti made a secret visit to Karna and revealed to him that he was, in fact, her son and not that of Radheya. She pleaded with him to join the Pandava camp and promised that when victory was won, he and not Yudhishtra would be crowned the monarch. Karna was overjoyed to hear that he too was of royal lineage but declined his mother's offer. He said, "For me, loyalty overrides all other considerations. I am in no position to pass judgements over Duryodhana. He gave me shelter and support when none did and my duty is by his side, irrespective of his intrinsic qualities." "Mother, I promise that I will cause no harm to four of the Pandavas but Arjuna is not in that list. Right from the beginning he has established himself as my sworn enemy and him I cannot spare even if he be my own brother. So it has to be either him or me. But mother, look at it this way; whether I die or Arjuna does, you will still have five sons." "No Karna," Kunti replied, "your calculation is wrong for either way I lose." Karna is a character who is not mentioned much and if he is, he is generally maligned. However, Swami rates him very highly and has spoken about him on many occasions. All that is reserved for the next episode! Till then, all the best and may God be with you.